Chicago Cubs starting pitcher Matt Garza throws in the first inning. Jhoulys Chacin tossed a six-hitter for his first career complete game, Chris Iannetta hit a bases-clearing triple and the Colorado Rockies won their seventh straight, beating the Chicago Cubs 5-0 on Friday night. The Rockies are off to their best start in franchise history, improving to 11-2 behind the performance of Chacin, who's picking up the slack quite nicely with ace Ubaldo Jimenez sidelined due to a cracked cuticle on his right thumb. In windy and cool conditions, Chacin (3-0) struck out seven and walked two. He smacked his fist into his glove when the Rockies recorded a 5-4-3 double play to end the game. This was the second start this season in which Chacin has held a team scoreless. The 23-year-old righty bottled up the Los Angeles Dodgers for seven innings on April 5. Todd Helton added an RBI single while Iannetta had just the second triple of the season for the Rockies, who own the best record in baseball. Matt Garza (0-2) turned in a third straight erratic performance, surrendering five runs and seven hits in six innings. That despite doing what most pitchers haven't been able to recently: Limit the damage done by Carlos Gonzalez and Troy Tulowitzki. The three and four hitters in Colorado's lineup were a combined 1 for 8 on the night. 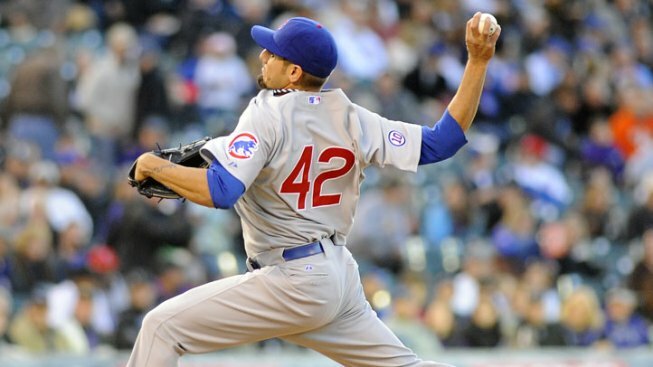 Garza was acquired from the Tampa Bay Rays in the offseason to bolster the Cubs' rotation. He won 15 games with the Rays in 2010. The hard-throwing righty's undoing on Friday was the second inning. With the bases loaded, Iannetta hit a pitch from Garza to deep center that Marlon Byrd couldn't quite corral. All three runs scored and when Starlin Castro's relay throw to third ended up in the dugout, Iannetta sauntered home, too. The rally was started with a single from Tulowitzki, one of the hottest hitters in the league. The smooth-swinging shortstop had a torrid four-game series in New York against the Mets, going 10 for 16 with four homers and eight RBIs. Tulowitzki took a little time to get his swing dialed in _ he started the season in an 0 for 9 funk after signing a lucrative long-term deal over the winter _ but now even his outs are loud. He entered the game leading the majors with seven homers. He's putting together the type of tear like he had last September, when he hit 15 homers, a franchise record for a month. Tulowitzki insists hitting isn't as easy as he's making it look right now. "At any point and time, you can go south. I know that," Tulowitzki said. "Just trying to do what I do out there and trying to play the game hard." The Rockies have switched around their starting rotation, pushing ace Jimenez's return to the mound back a day. Jimenez, who's on the 15-day disabled list, was scheduled to throw Monday to open a three-game series with San Francisco. Now, Esmil Rogers will face Tim Lincecum and the Giants, while Jimenez goes Tuesday. Rockies manager Jim Tracy said Friday the decision was made not so much because of the condition of Jimenez's cut on his pitching hand, but to keep Rogers on his regular pitching schedule. "It's good. I don't feel any pain," Jimenez said of the injury before the game.